Plastic bags, also called “poly bags,” are one of those modern conveniences we take for granted. But 60 years ago, no one ever considered the question, “Paper or plastic?” Back then, people also managed to get by without Ziploc® bags or dry cleaner bags. This was because the technology for creating polyethylene film didn’t emerge until the 1940s during World War II. And the methods to create plastic bags from polyethylene film weren’t developed until the 1950s. 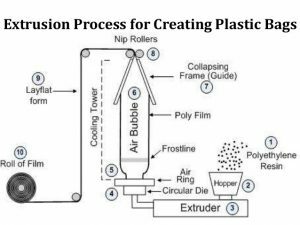 The most common way to produce poly bags is by blown film extrusion, also called the “tubular film process.” In a moment, you’ll see how it got this name. Anti-block—Prevents the plastic layers from sticking together (blocking). Slip—Helps the plastic bag open easier and allows items to slide in smoothly. Ultraviolet Inhibitor (UVI)—Protects the plastic from ultraviolet radiation, which can weaken the plastic’s strength and fade its color. The polyethylene arrives at the plastic bag manufacturing facility in pellet form, referred to as resin. Die: A mold that produces a desired shape. In blown film extrusion, the die shape is circular. Extruder: A pump for very thick fluids. The extruder contains a rotating screw that mixes and melts the material. Frostline (or freezeline): The point where molten polyethylene solidifies into a film. Gusset: Indentations in the sides of plastic bags that allow the bag to lay flat when stored but expand when opened. Layflat Form: Tubular poly film that’s been flattened for rolling and further processing. Nip Rolls: Two motorized rolling pins at the top of the cooling tower that pull the poly film upward. Polyethylene: A type of thermoplastic resin made by altering the molecules of ethylene gas. The following drawing shows how plastic bags are created. The machine used to create the plastic bags is an extruder and die assembly. 1. The machine operator pours the polyethylene resin into the hopper. 2. The hopper feeds the resin into the extruder. 3. Heating elements and the turning of the extruder screw melts the resin into molten form and forces it through the extruder. 4. The molten poly flows evenly up and over the circular die. a. Grabs it wearing protective gloves. b. Pinches the molten poly together. c. Ties a rope to the top of the molten poly. The rope leads upward to a pulley system. d. Pulls the other end of the rope to move the molten poly upwards. At the same time, the air ring blows cool air upwards, which solidifies the molten poly. 6. As the tubular shape moves up, the machine operator inserts an air gun through the poly film to blow in additional air. This step is repeated until the diameter of the tubular poly film reaches the required bag size. 7. Along the length of the tower are guides to keep the tubular poly film from shifting. As the film reaches the top of the cooling tower, the guides gradually flatten it into a layflat form. If the plastic bag will have gussets, special frames (called “gusset boards”) indent the sides of the tube before it is flattened. 8. At the top of the cooling tower, motorized nip rollers grab the solidified poly film. The nip rollers now take over the job of moving the poly film up the cooling tower. Note: Extruder and die assembly towers can be 25 to 35 feet tall. This height is needed to cool the polyethylene film before the layers are flattened together. Travels through a bag machine that seals the bottom of the plastic bag and perforates it at the same time. The perforation allows the bags to be easily torn from the roll. May also travel through a separator that breaks the perforations and stacks the poly bags on top of each other for bulk packaging in a box. 10. For poly bags with complex features (for example, multi-colored printing, Zip-Loc® closure, or door knob hang holes) the film is wound on a roll and then taken out of line for further processing at a converting facility. A converting facility has a variety of specialized equipment to create the diverse features found in plastic bags today. 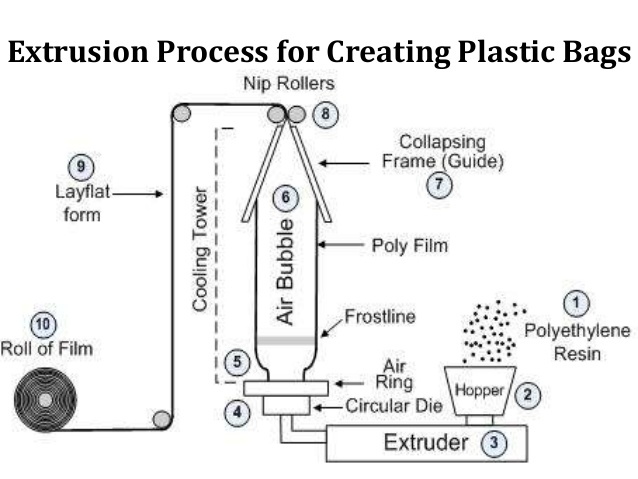 The blown film extrusion process for creating poly bags hasn’t changed much over the years. But what has changed is how we use plastic bags in our daily lives – whether we carry home groceries in “T-shirt” plastic bags or seal an expensive cut of meat into an air-tight freezer bag. What was once a novelty is now an everyday convenience.  Multi-Pak USA, Inc. supplies plastic/poly bags and closely-related products to businesses nationwide for use in a variety of industrial and promotional applications. We invite you to try our simple online Request for Quote form for your next order. For more information, visit our web site at http://www.multipakUSA.com or call 1-800-229-9950.